We are very blessed. Many great volunteers come to Baan Unary. Some volunteer are so committed to us that they come back again and again to help us. One of those volunteers is Paula. Paula came to know us five years ago. She returned again and again to Baan Unrak. 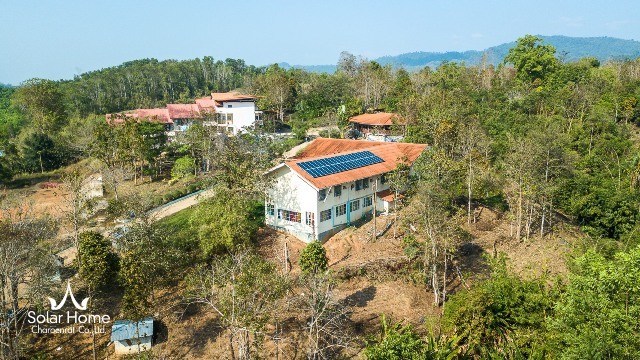 Her commitment is not only … Continue reading "Paula Brings Clean Energy to Baan Unrak"
Art is such a healing tool from the stress and the ups and down of life. It can heal deep emotional wounds inside us. We are so lucky that here in Baan Unrak we have often volunteers that bring the different branches of the aesthetic science to us. We try to take every opportunity for … Continue reading "Volunteers’ Help"
Fiorella is a psychologist from Italy. She came to visit us and volunteer here for two weeks. She immediately fell in love with Baan Unrak. She was able to get close to all the children in the short time. She took on a job of translating and interviewing children for their sponsor. So she came … Continue reading "Psychologist Fiorella"
February 19 was a very emotional moment during the graduation ceremony of two of our children. Both Prema and Kushuma, came to Baan Unrak as babies. Prema only few days old and Kushuma was six months old. They grow up with us and we could never imagine that 18 years ago we would see this … Continue reading "Congratulations Prema and Kushuma!" On the 11th February, our nursery school from Myai Thar Yar village, Three Pagoda Pass, Myanmar celebrated year school end ceremony. We have 27 children at our nursery and we gave them some presents for the school close. Around 70 peoples attended our ceremony and 4 monks were there to oversee our ceremony. We are very … Continue reading "Nursery School Close Ceremony at Myai Thar Yar"
Through the dedication of very serious volunteer of Baan Unrak, we were able to contact a leading environmental company in Bangkok, Premier, that thanks to their great generosity and effort has helped us realize our dream of clean energy. In February, 2018, the company installed 42 solar panels that will meet all our average annual … Continue reading "Thank you, Premier"
Thank you Matoo for your love and sacrifice! Matoo has been a blessing as former child of the home; she works here while she continues her education. She is so valuable on many different projects around our community. She started with the bakery and then went to the kitchen to help with the cooking. Finally, we saw the real passion of Matoo: to … Continue reading "Thank you Matoo for your love and sacrifice!"